One of the most common ways of setting the arts in parallel, at least from the literary side, is through the popular rhetorical device of ekphrasis. The original meaning of this term is simply an extended and detailed, lively description, but it has been used most commonly in reference to painting or sculpture. In this lively collection of essays, Andrew James Johnston, Ethan Knapp, and Margitta Rouse offer a major contribution to the study of text–image relationships in medieval Europe. Resisting any rigid definition of ekphrasis, The Art of Vision is committed to reclaiming medieval ekphrasis, which has not only been criticized for its supposed aesthetic narcissism but has also frequently been depicted as belonging to an epoch when the distinctions between word and image were far less rigidly drawn. Examples studied range from the eleventh through the seventeenth centuries and include texts written in Medieval Latin, Medieval French, Middle English, Middle Scots, Middle High German, and Early Modern English. The essays in this volume highlight precisely the entanglements that ekphrasis suggests and/or rejects: not merely of word and image, but also of sign and thing, stasis and mobility, medieval and (early) modern, absence and presence, the rhetorical and the visual, thinking and feeling, knowledge and desire, and many more. 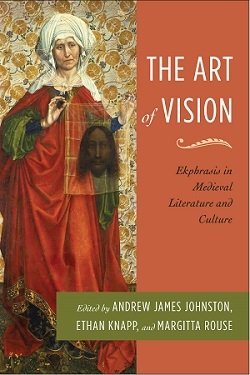 The Art of Vision furthers our understanding of the complexities of medieval ekphrasis while also complicating later understandings of this device. As such, it offers a more diverse account of medieval ekphrasis than previous studies of medieval text–image relationships, which have normally focused on a single country, language, or even manuscript. Andrew James Johnston is Chair of Medieval and Renaissance English Literature at Freie Universität Berlin, Ethan Knapp is Associate Professor of English at The Ohio State University, and Margitta Rouse is Associate Fellow of the Collaborative Research Centre Episteme at Freie Universität Berlin.